The webcam hides away on the keyboard for "privacy"
Huawei did not have a smartphone to unveil at this year’s Mobile World Congress but it did have a new laptop and a couple of tablets on display. 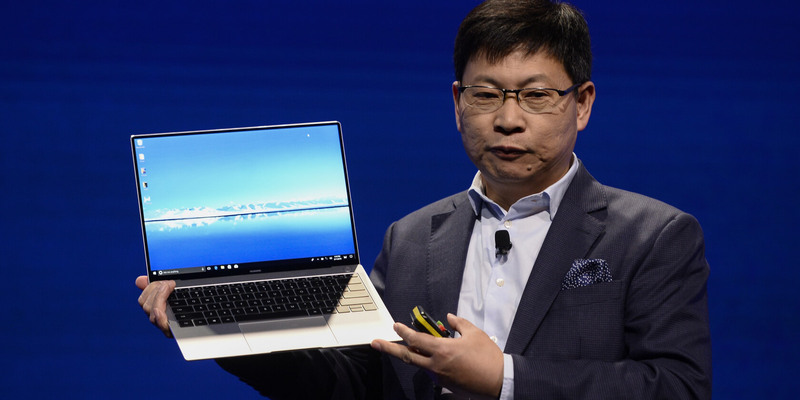 The MateBook X Pro is the Chinese company's follow-up to the MateBook X it released last year. Physically, it is about the same size as its predecessor but the ultra-thin bezels give it slightly more screen real estate. Last year’s model sported a 13-inch screen while the Pro's is 13.9 inches (3,000 x 2,000 resolution touchscreen). Due to the super thin bezels, Huawei was not able to place a webcam in the usual location right above the screen. Instead, it has stealthily stashed the camera on the keyboard amid the function keys. It appears as a key with a camera icon on it, but when pressed, pops up to reveal an upward-facing lens. Huawei touts it as a “privacy feature.” In a way, I like the idea of a hidden away camera but according to The Verge who had some hands-on time with it, the angle of the lens ruins that idea. It does not point far enough up to capture your face unless you slouch or lean way back. There will be two versions released — one with an Intel Core i5 processor and the other with an i7. Both will carry Nvidia GeForce MX150 GPUs. It will have a fingerprint scanner incorporated into the power button and sports two USB-C ports and one USB-A. Huawei claims the 57.4 Wh battery is capable of up to 12 hours of video playback. However, mileage will vary unless you operate your laptop under strict laboratory conditions. The MateBook X Pro will launch this spring starting at around $1,850 in either space gray or mystic silver.